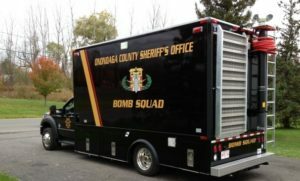 The mission of the Bomb Squad, is to maintain a highly trained team for the citizens of Onondaga County and surrounding counties, to raise public awareness regarding hazardous devices, and to provide departmental Hazardous Device and Bomb Threat training. This team consists of deputies who are Certified Bomb Technicians and Hazardous Materials Technicians, as well as apprentice technicians who assist in the safe removal and disposal of suspected devices. They are trained and certified at the 5-week F.B.I. Hazardous Devices School. Also, there is mandatory monthly Bomb Technician training and mandatory recertification mandated by the F.B.I. Hazardous Devices School and the F.B.I. Bomb Data Center. The deputies on this team instruct Sheriff’s Office personnel, local law enforcement, area business/industry, and local school districts on bomb threat awareness and hazardous devices. They also conduct Weapons of Mass Destruction training.